Sintered Samarium Cobalt (SmCo) magnets fall into two groups of chemical composition: SmCo5 and Sm2Co17. Empire Magnetics accepts all -sized orders for custom Samarium Cobalt magnets as per customer design. extremely high magnetic standard, excellent thermal stability and distinguished corrosion resistance. Sm2Co17 is better than SmCo5 in all respects. Because of these merits, Samarium Cobalt magnets are ideal component specially in applications where temperature changes across a broad range or environment is corrosive, such as chemical pump couplings. The (BH)max of Sm2Co17 is up to 30 MGOe and its Br up to11,000 Gauss. Maximum Hci of Samarium Cobalt magnets are as high as 25 KOe. Reversible temperature coefficient is -.03 ~ -.0435 of Br/°C. Maximum working temperature is 250 ~ 300°C, under which Samarium Cobalt magnets maintain good magnetic property to temperature changing. There is no need of surface treatment to Samarium Cobalt magnets even if they will work in humid environments. It is not possible to machine Samarium Cobalt magnets with conventional machining. Samarium Cobalt magnets can be abrasively machined with coolant served to absorb heating and dust. 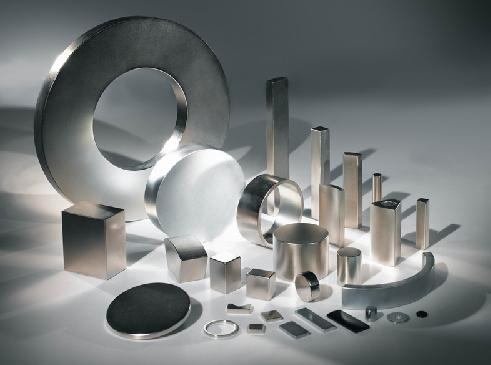 Without coolant, rare earth magnets could crack and chip by the heat produced during high speed cutting or grinding, and the sparks contain the easily oxidized grinding dust that could cause fire! NEMC Samarium Cobalt Magnets are RoHS compliant. 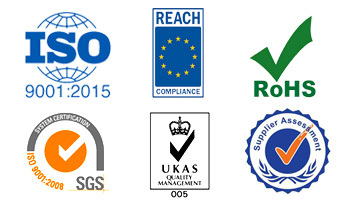 NEMC has been ISO 9001:2015 Certified since 2009.